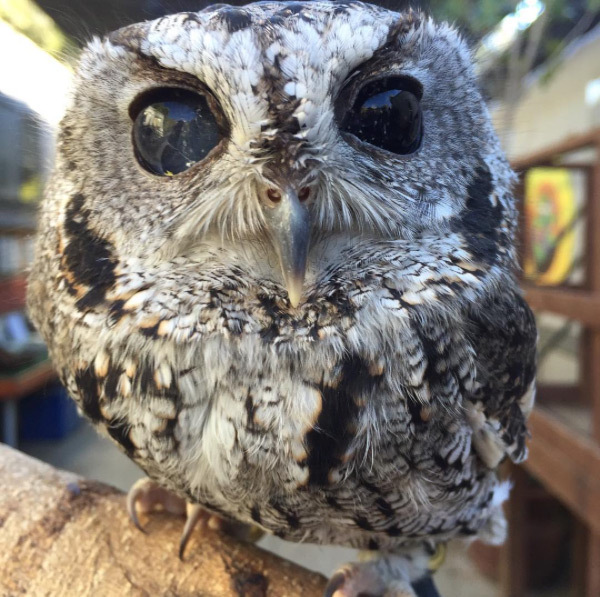 Meet Zeus, a blind Western Screech Owl with eyes that look like a celestial scene. Zeus was given a home at Wildlife Learning Center in the summer of 2012. Prior to living at WLC, Zeus was treated at a wildlife rehabilitation facility after he was found emaciated and blind on someone’s front porch in Central California. Veterinarians nursed him back to health, but deemed him “non-releasable” due to his loss of vision, preventing him from hunting and surviving on his own in the wild. It’s believed that he only has about 10% of his vision. Please consider making a donation to the Wildlife Learning Center to assist in the care of this wonderful animal.